Put some style points up on the board by wearing all cotton Steven Land dress shirts. Steven Land dress shirts are simply the hottest new menswear brands going and their collection of 100% cotton dress shirts simply confirm this. 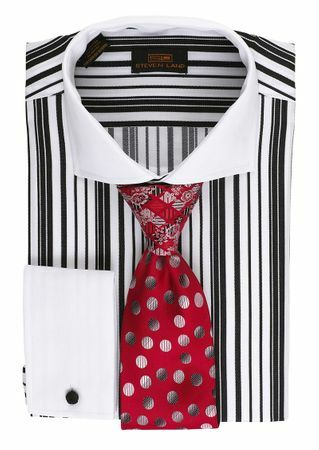 This black woven stripe Steven Land Dress Shirt features a spread collar, french cuffs and is ready to just add a big know silk tie and call it a day. Tie is not included.